“Holistic Vision” includes ophthalmology but questions its conclusion on floaters and goes beyond. For the observation and open eye meditation reveals a connection between altered states of consciousness and the way floaters look. 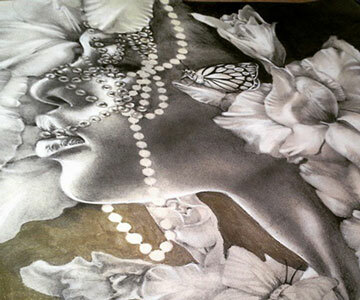 Furthermore, a look at different cultures highlights floaters as an object of art and spirituality. 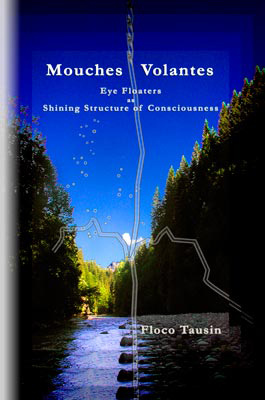 True to this “holistic vision”, Floco Tausin pursues the question whether these spheres and strings are first appearances of a shining structure of consciousness within which we cover a distance to our spiritual origin – a path that lights up through open eye meditation. Eye floaters – vitreous opacities or consciousness light? A glimpse into the art and myths of former and non-Western cultures suggests that floaters had a spiritual meaning for many people. 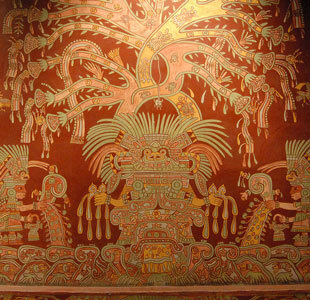 This article presents floater motifs and their meaning in pre-Columbian Mesoamerican cultures. The newest Lead Story can be accessed by members only. For Nestor, life is a movement towards a point where consciousness is completely filled by the simultaneity of absolute calmness, knowledge and ecstasy. This movement, however, is not a constant one, as we know from our everyday lives. Sometimes we’re stuck with an inner or outer task and don’t progress for days or weeks. Then again, we live comfortably for weeks, months or years. We constantly extend our knowledge, but don’t make big consciousness leaps. Finally, there are those moments that radically change our lives. According to Nestor, these different movements can be comprehended through seeing. Our spheres and strings may look the same for years or decades. When observing our floaters, we may realize lateral jumps of the light, whereas vertical jumps (zoom effects) are limited, all movement takes place within a single layer (see News 1/12 and News 2/12). This stability in one layer means that an individual is stable in his or her consciousness, i.e. we move in our own familiar range. 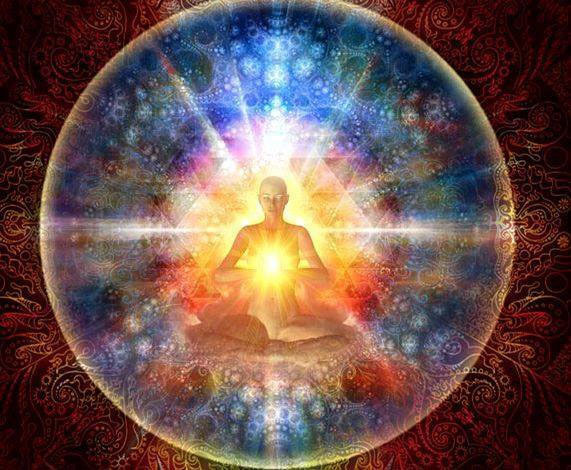 We use our energy to work within that range and, at best, to gradually expand it. Progress in consciousness development comes slowly, and it may take years to realize it as such. On the other hand, the spheres and strings can dramatically change all of a sudden, clearly increasing or decreasing in number, size and luminosity. This can happen when intense moments in our life loosen the stability in a layer of consciousness. The seers try to loosen this stability and progress on the “path in the shining structure” by combining practices of concentration and ecstasy, in particular by increasing the “inner pressure” or intensity. Either way, this movement means that a person leaves his or her familiar setting and balances between several layers until his or her consciousness becomes stable again, ideally on a layer closer to the “source” than before. Readers’ tips and experiences regarding entoptic phenomena. Study had an encounter with people who allegedly are initiated into the religious traditions of the Fon and Yoruba, two major West African ethnic and linguistic groups. The belief of these people living in Nigeria, Benin and Togo centers around the spirits (vodun in Fon, orisha in Yoruba) that dwell in natural phenomena like stones, plants, animals, rivers, rain, but also protect clans, tribes or nations, and may even possess human beings. Illness or unusual states of consciousness are often considered as spiritual disharmonies. For example, while we may associate symptoms like seeing, hearing or feeling unusual things with neuropsychological conditions like depression, schizophrenia or epilepsy, for West Africans, they probably indicate that the affected person is under the influence of witchcraft, i.e. cursed. Thus, they rather consult a priest or other spiritual practitioner than a physician or psychiatrist (Oguejiofor/Wendl 2012). Unfortunately, Study’s report is not specific: First, we are left to wonder whether seeing spots is indeed a known symptom in traditional West African spirituality and medicine that indicates being cursed. A present-day Roma practicing West African magic in the US may be influenced by a lot, from genuine Fon and Yoruba spirituality, New World beliefs consisting of Christianity, Haitian Vodou (Voodoo), indigenous American worldviews and modern European magic, to the spiritual knowledge circulating on the internet – like the Indian or Vedic notions of magic, according to which seeing “black dots or geometrical shapes” is a common symptom for advanced stages of “black magic” (Vedic Wisdom 2010-2015). Second, even if seeing spots or dots are understood by the Fon and Yoruba as a symptom for spiritual illness, we don’t know for sure if these “spots” are indeed the shining structure floaters, which, although they can appear dark, rather look transparent and luminous (Tausin 2012). Still, it is possible that floaters are interpreted by some people as a symptom of “black magic”. And it does even make sense, if we look at the contemporary Western floater sufferers. They not only experience their floaters mostly as troubling dark spots, but many also suffer from stress, anxiety, depression, even suicidal thoughts, which are sometimes treated with anti-depressants (Degenerative Vitreous Community 2010, 2014). Since shining structure floaters are a consciousness phenomenon, they mirror the observer’s psycho-physiological state. So while seeing black spots indicates states of mental or spiritual debility or disharmony, seeing luminous spheres and strings means that we are mentally or spiritually strong and balanced. In West African terms, the former may be ascribed to “black magic”, the latter to “white magic”. While the term “magic” implies that we are the victims of extrinsic powers, the seers’ view is that we are the “magicians” ourselves, and that we have an impact on whether our magic – and our floaters – are “black” or “white”. Thanks, Study, for sharing your experiences! Michael knows many entoptic phenomena since childhood, but has not really wondered about or seen a deeper meaning in them so far. Reading “Eye Floaters – The Shining Structure of Consciousness” has not only given him the opportunity to understand his observations in a new light, but also to connect them to his own spiritual experiences and exercises. So when reading about the practice of “doubling” – seeing double images by crossing one’s eyes while looking on two concentric, black and white circular figures (Tausin 2009) – he remembered the “Tables of Chartres”. Michael had some intense and challenging experiences with this old European form of meditation, which was passed down by the Roma (Derlon 1978). Now, he has combined the Tables of Chartres with floater meditation and designed some exercise tables, which he kindly provides to anyone interested. Two kinds of “Floater tables” by Michael, 2015. 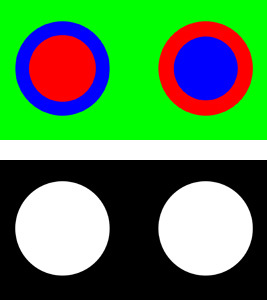 Through doubling, the upper, colored tables can be superimposed and synchronized into a purple circle in the middle, which, in turn, stands in contrast to the green background. As an effect of doubling, the brain hemispheres – or more spiritually, our dual complementary forces – synchronize (Pennington 2002), the “inner pressure” increases, and the “inner sense” awakens (Tausin 2009/2006). The lower, black and white circular figures work somewhat different: The white circle is an area to observe shining structure floaters. With this, Michael gives us a means to observe floaters in the concentrated state. Because when concentrated – concentration in terms of optics, physiology as well as consciousness – floaters become smaller, sharper and more luminous. 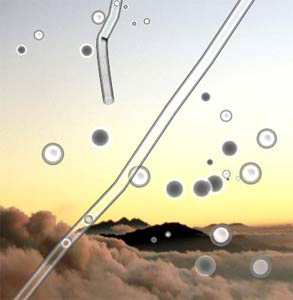 This can be observed in the open sky when doubling floaters. But if you have a hard time observing this, try Michael’s black and white circular figures: The doubling is stabilized by the overlap, and the floaters can be well observed in the white middle disk. Michael recommends that you print the tables and use them in sun light, instead of looking at them at the monitor. Von Däniken, Erich (1970): The sphere – The Ideal Shape for Space-Craft. Chapter in: Return to the stars. Evidence for the Impossible. Souvenir Press Ltd. 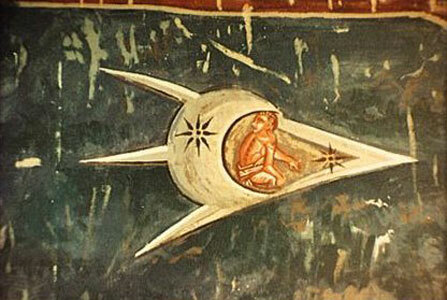 Were the gods astronauts in reality? Has the Earth been visited by extraterrestrial beings in prehistoric times? Have we been influenced or even created by them? These questions are at the core of the work of Swiss author Erich von Däniken (EvD). In April, the tireless researcher reached the age of 80. For half a century he tries to show that, thousands of years ago, intelligent extraterrestrials flew in their spaceships to Earth. That they have influenced the development of human culture. And that their presence is indicated by the art of early man. Such thoughts were expressed before EvD. But his first books on ancient astronauts, published in the 1960s, captured the spirit of the time – a time, when the first moon landing stimulated peoples’ imagination and inspired science fiction. So what does the most successful Swiss author – 37 books written and translated into dozens of languages, 70 million copies sold – have to do with shining structure floaters? It’s the spherical or circular shape that he explores in the evidence of ancient cultures and civilizations. Passion for an inspiring idea, amiable assertiveness when speaking in public, comprehensive presentation for a wide audience, tireless researching and working, as well as a generous understanding and handling of facts – all of this is part of the phenomenon Erich von Däniken. It is through the latter that EvD was an easy target for archaeologists and other “bean counters,” as he likes to say. Thus, critical thinkers reject the hypothesis that the ancient representations of circles and spheres actually indicate spaceships. In fact, it needs some imagination to see the influence of extraterrestrial intelligences in the mythic accounts or the ancient art works. Sometimes, even the spherical shape has to be imagined, e.g. in the case of Polynesian Po, the Mayan gods who “see in the darkness” or the “something house” of the Chibcha – the concepts are not verifiable in every case. Yes, EvD travels down the path of the unexplainable, where religions, myths and unbelievable stories of all sorts have unfolded for ages. So far, he failed to provide any evidence about the visit of extraterrestrials on Earth. And his account about his contact to an alien life form (Tomy and the Planet of Lies, 2012) did not exactly increase his credibility. So is EvD’s hypothesis just nonsense? No quite, for his work shows something more essential. Like, how little we know about our past, and how limited specialization is if no research is done beyond its boundaries. Archaeology, anthropology, and prehistory try to solve “mysteries,” too. Investigations of the ancient art of Mesoamerica, for example, provide dozens of interpretations of the dotted or concentric circles (see the Lead Story in this issue). Not only that none of these can be considered certain or claim universal validity. But to be plausible, they also need to tie in with the shared and accepted knowledge, that hardly brings about waves of innovation. Yet, a lot can be won if the mind is allowed to wander freely, if the spherical representations may be anything thinkable, from stars, flowers, jewels to entoptic phenomena like floaters and to UFOs. This is what EvD’s wild jumping through space and time reminds us of, namely, the conditions of our existence, i.e. how much we take our life for granted, how little we dare to dream, but also what possibilities open up if the consciousness deepens into the light that always seems within reach. - Von Däniken, Erich (1968): Chariots of the Gods. Souvenir Press Ltd. Thanks for your feedbacks, Sundeep and Kellie. Enjoy seeing light everyone – wherever you focus.